"Hampden is possibly one of the worst stadiums I have played in for atmosphere." Former Scotland captain Scott Brown has slammed the Scottish Football Association's decision to stay at Hampden describing it as one "the worst stadiums for atmosphere". The Scottish Football Association (SFA) announced on Tuesday it had agreed a £5m deal to buy the stadium from Queen's Park instead of moving to Murrayfield. The use of Celtic Park and Ibrox had previously been ruled out following a bid process. The Celtic captain, who retired from international football earlier this year, told STV: "Hampden is possibly one of the worst stadiums I have played in for atmosphere. "For footballing-wise and Scotland as well, I think we should be playing at Celtic Park, Ibrox and the smaller games, when you only get 17 or 18,000, should be at Hibs and Hearts, and the bigger games could be at Murrayfield as well. "We've got some great stadiums here and we choose to use the wrong stadium for a football match." SFA chief executive Ian Maxwell promised to find ways to improve the fan experience by redeveloping Hampden. Brown, who played 55 times for Scotland, said: "It's not going to happen, you need to start that stadium all over again. "It was built for a running track and you are not going to get the fans and the noise on top of you that scare the opposing players. It's easy for them to turn up, big open pitch, hardly any fans can be heard. "You play at Celtic Park, Ibrox, Tynecastle, you have got the atmosphere there and that's what makes the opponents a little bit scared to come and play there." 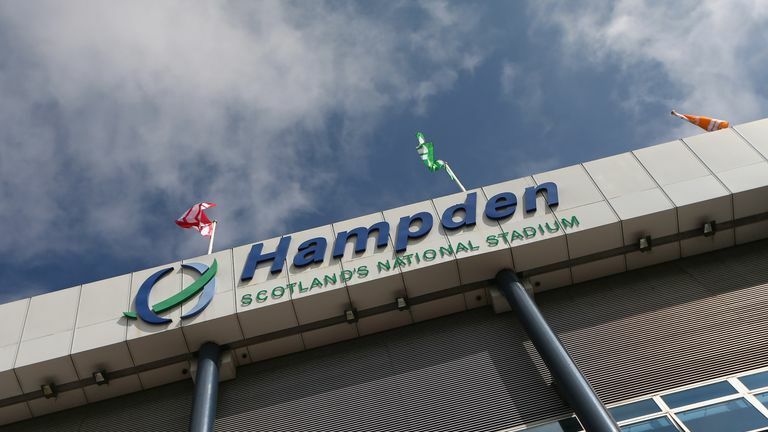 Queen's Park vowed to discuss the development with their members after the deal ensured they will need to prepare to move next door to Lesser Hampden. The £5m fee will allow that ground to be redeveloped, while a move to Murrayfield would have cast major uncertainty over the future of Scotland's oldest football club. A statement read: "Queen's Park welcomes the Scottish FA's announcement, whilst acknowledging there are still many complexities to be worked out with various stakeholders. "This will undoubtedly have huge implications for our club and our first priority is to engage with the club membership which due to confidentiality clauses we have been unable to do thus far." The Scottish Rugby Union thanked the SFA for the opportunity to be involved in the bid process. Chief operating officer Dominic McKay added: "We submitted a compelling and thorough bid package which we believe would have been excellent for the Scottish FA. "Our presentation clearly demonstrated the significant benefits of Scotland's largest stadium and how we have worked to develop a quality experience for all visiting fans. "We are naturally disappointed this once-in-a-generation opportunity to develop a partnership for a true national stadium for Scotland at Murrayfield, which would have enabled the country's two largest sports to work side by side for the wider benefit of Scottish sport and society, has not been taken."